HAPPY NATIONAL STRAWBERRY DAY!!! . . . LAST WEEK!!! Well, I thought I had this post scheduled to go live last Saturday – “Strawberry Day” . . .but somehow, that didn’t happen! I love the card, so will show it to you now . .. a few days late!! LOL! Strawberries . . . .my favorite fruit!! I love living in an area that has a LONG strawberry season, and can’t wait for the first crop to get ripe! 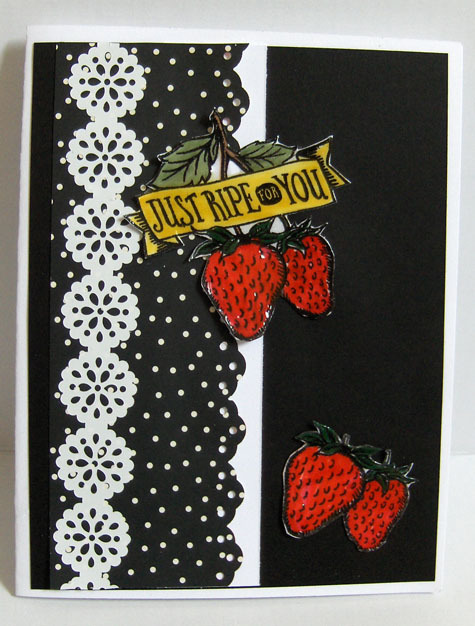 Since this is National Strawberry Day, I decided to make a special card in honor of this day! 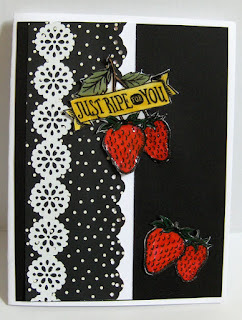 I had fun with this set from Stampin’ Up, and made the strawberries “pop” with some Crystal Effects covering them. Hope your first strawberries of the season are not too far away!